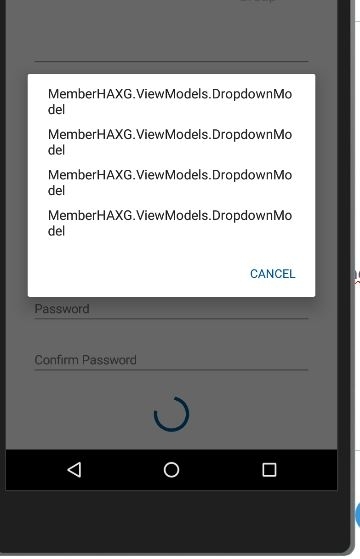 I am using basic MVVM structure and I am trying to bind data from API form my ViewModel using async when I use static record its loading the picker but when I try to add dynamic records I am not able to bind the record. my screen getting frozen. If I am not able to resolve by tomorrow my manager will not allow me to work on Xamarin anymore. On the one hand you are writing that your app is freezing, on the other hand you say that HPList is assigned to correctly but data is not reflected in the picker. That's making it a bit hard to diagnose. You should consider refactoring your code a bit and don't call an async method from within the constructor. Make sure to change your BindPicker method to return a Task and not void . Also, BindPicker() should not replace HPList but rather Clear() it and then Add() the items (I presume, HPList is an ObservableCollection<T>). // Here any other setup you have to do on your page. This makes sure that all exceptions will be caught and shown correctly and you prevent race conditions. Thanks for your response, I am trying below mentioned PickerBindBehavior. FeedItems is Observable collection which have 4 value right now. Could you please help me to fixed it.